Along the way, we have heard several things about Siberian huskies that are just not true, or if it's true does not apply to every single Siberian. Please keep in mind that each Siberian is an individual and the environment it grows up in can reflect its behavior throughout life. The following paragraphs contain what we have learned through the years. I hope you find this information useful. Siberian Huskies are most decidedly NOT wolfdogs. Siberian Huskies are no more a wolf than your friend's teacup chihuahua. The Siberian Husky breed has been around for a couple of centuries now, and is one of the oldest breeds of dogs around. Siberian Huskies have been bred to look as they do in order to survive the harsh climate they were bred to work in. Siberian Huskies have been discriminated against in several areas because they "WOO" instead of "BARK." Most Siberians do have a 'wolfish' appearance due to their color. It is best to be cautious, because you never know if your neighbor understands the difference. There are many people out there who will shoot first and ask questions later. We learned this the hard way when my own cousin shot and killed our beloved Tornado. Siberian Huskies Make Great Yard Dogs. . . I laugh whenever I hear this one. Siberian Huskies were bred to RUN. Siberians will run at any opportunity, and it is not unusual to find them a mile or two away from home whenever given the chance. The desire to run is hardwired into their genetic make-up. 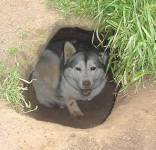 Responsible Siberian owners need to keep their dogs in an enclosed area for their dogs' safety when they are not supervised. Siberian Huskies Are Reliable Off Their Leashes. . .
As I mentioned above, Siberians were bred to RUN. Even with the best of training, Siberians are known to be unreliable off-leash. Owners must make sure they stay under control at all times. A Siberian husky is a great work out partner. Let him/her take you for a run, I promise it won't be the other way around! I found out this the hard way when I got my first Siberian. Siberians LOVE TO DIG. They will dig out of kennels, they will dig a hole because they are bored...Siberians really don't need a reason to dig other than they just want to. If you don't mind having unusual shaped holes in your yard, you might be ready for a Siberian. Look at the following series of pictures...these were forwarded to me by a fellow Siberian enthusiast. NEVER underestimate the determination of a Siberian. Siberian Huskies Do Not Eat Flowers. . .
Siberians will be more than happy to help you prune your prized petunias, sweet williams, butterfly bushes, and rose bushes. I love having a flower bed, but I have pretty much given up on having a well manicured one. I haven't met a Siberian yet who doesn't like the taste of these plants, but I still haven't figured out how they don't get rose thorns in their tongues. If you love your flowers and don't want to see them chewed on, pulled up, or eaten, then make sure put a fence they can't get over, under, or through around your prized vegetation. Better yet, plant something hardy and non-toxic. Siberian Huskies Can't Climb. . .
Siberians can and will climb if they think they can get out of a kennel. My Siberians have been known to climb 4-5 feet high, almost like a cat. The main prevention for this is to keep them entertained with something they won't get bored with. Siberian Huskies Aren't Good With Kids. . .
Siberian Huskies Make Good Watchdogs. . .
Well...maybe in a select few. Siberian Huskies are pack animals and regard everything within their realm to be theirs. They are likely to treat a thief in the night the same way. On a good note, with all the "talking" Siberians do, you will probably know if someone comes around. If you spend enough time with a Siberian husky, you can tell a difference between a happy woo and a cautious woo. Well....this one is both true and untrue at the same time. During most of the year, Siberians do not shed very much at all. However, twice during the year, they blow their coats. The thick undercoat comes out, and for awhile, your Siberian can look shaggy if the he/she isn't brushed a lot. A really good undercoat brush and patience will take care of this problem. Don't buy a $60 furminator. Furminators strip the outer guard hair and damage their coats. By a $4.25 (online) undercoat rake at Wal-Mart. They are cheaper and do a better job. After 10 minutes of brushing Shade...No, we aren't joking! Seriously? Obviously this has been posed to us more than once or it wouldn't be here. If you lived in Alaska and kept your nose wet, it would soon fall off from frostbite! Yes, all dogs in general keep their noses wet because it helps them smell scents better, but it's perfectly ok for them to have dry noses too. A dry nose is not necessarily indicative of anything other than the dog hasn't licked it lately.